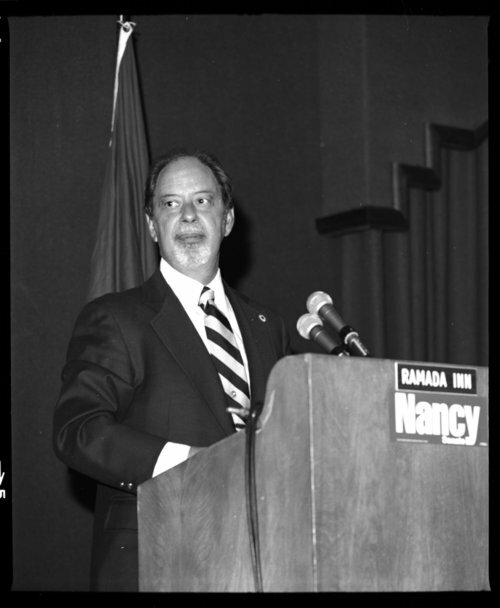 These five black and white photographs show a reception for Nancy Landon Kassebaum's induction to the United State Senate, (1978-1997), in Topeka, Kansas. The first photograph shows Kansas Governor Robert Bennett. While images two and three show U.S Senator from Kansas Bob Dole. The third photograph shows from left to right: the thirty-eighth President of the United States Gerald Ford, First Lady of Kansas Olivia Bennett, and U.S. House of Representative from Kansas, Larry Winn. The fourth image shows the people standing during President Ford's introduction.